The most widely distributed bear species in the world, the Brown Bear also ranks as the largest land predator on earth, along with the Polar Bear. The species splits into several sub-species in its vast geographical distribution, some of the well-known ones being the Grizzly and the Kodiak of North America, the Eurasian Brown Bear of Europe, the Tibetan Blue Bear, the Himalaya Brown Bear, the Mongolian Gobi Bear (the most endangered bear in the world), and the Kamchatka Brown Bear. 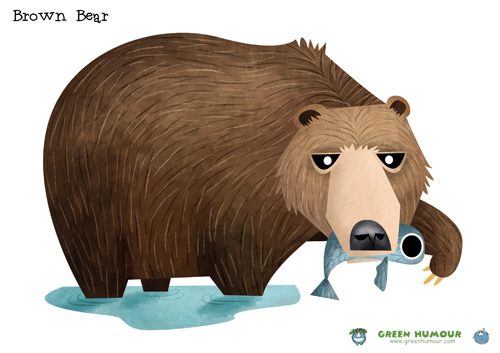 The Brown Bear is an omnivore with the widest variety of diet for any bear, ranging from deer, fish and rodents to acorns, pine cones and berries. America's most common bear, the American Black Bear is the only bear species that is not threatened on IUCN's Red List. It is smaller than the Brown Bear and is split into several sub-species across its range. The black bear's diet is omnivorous, varying widely with seasonal changes. It is an efficient hibernator, hibernating for well over 3 months. The Polar Bear is the largest land carnivore and lives in the Arctic Circle. They are christened "Ursus maritimus" in Latin, which means maritime bear, referring to the fact that they spend most of their time in the sea. Polar Bears are threatened by climate change and disappearing sea ice. 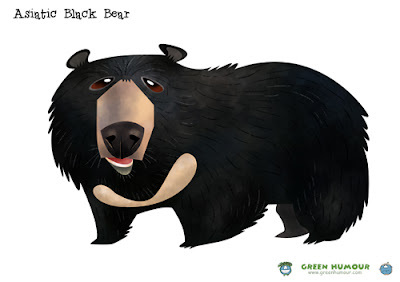 The crescent-shaped marking on the Asiatic Black Bear's chest gives it the nickname "Moon Bear". It is widely distributed, occurring as several sub-species across its range. The black bear is exploited heavily for its parts and for bear bile in Chinese medicine. 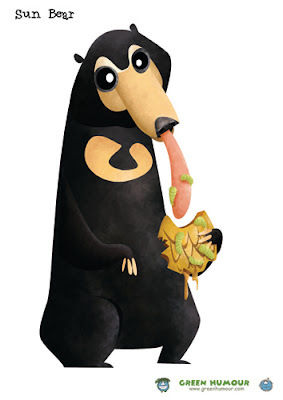 India's most common bear, the Sloth Bear is the most insectivorous of all bears and has in fact, evolved features similar to other insectivorous animals such as ant-eaters (e.g. missing upper incisors, a long snout and tongue, and powerful foreclaws to rip termite mounds apart) through convergent evolution. Sloth Bears are also fond consumers of honey. The cubs can often be seen piggybacking on the mother. The Spectacled or the Andean Bear is the only extant 'Short-faced Bear' (a sub-family that includes now extinct members from the Americas. Although it is the largest carnivore in South America, much of its diet is comprised of vegetable and fruit. It is also among the most arboreal of bears. Its name refers to the specs-shaped marking around the eyes. Hunting and habitat loss have pushed the bear to a 'Vulnerable' ranking on IUCN. The Malayan Sun Bear is the world's smallest bear species. Owing to its prodigious appetite for honey, it is also referred to as the honey bear. A peculiar feature is the incredibly long tongue, that is used to extract honey from hives. 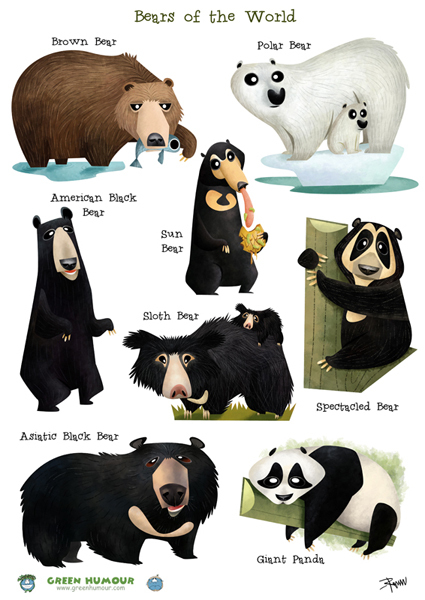 The name 'Sun Bear' refers to the bright patch on their chests, which according to folklore resembles the rising sun. Sun bears are threatened by poaching and habitat loss. One of the world's favourite mammals and a metaphor for wildlife conservation across the world, the Giant Panda lives in small pockets in China's mountains and is a conservation-reliant endangered species. It has evolved distinct features such as a round face and a large size, to be a specialized bamboo-feeder. The Panda is threatened by habitat loss. Prints and merchandise are available as a whole range of goodies. For orders outside of India, please visit my Redbubble store here. For orders within India, the prices for the goodies are listed here.